• Storage Optimization Advances, including Adaptive Compression and Multi-Temperature Data Storage, which are designed to optimize your storage environment and system performance. • NoSQL capabilities that help you implement models beyond relational, such as unstructured XML data and RDF graph triple data. Handling these new types of data along with your relational data is becoming a requirement in next-generation applications. 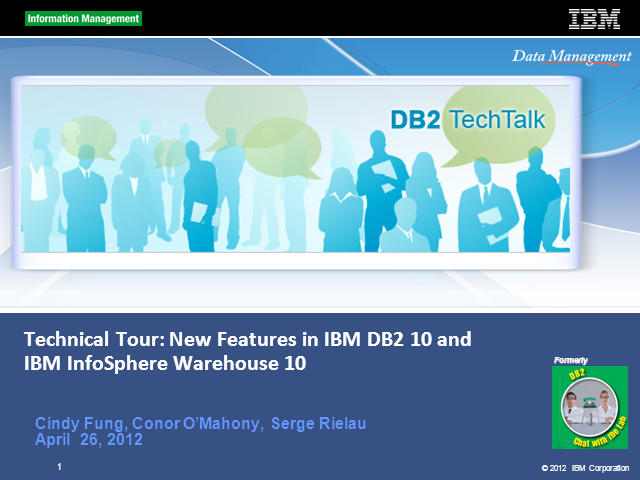 This technical tour is the first DB2 Tech Talk on the DB2 10 and InfoSphere Warehouse 10 product releases. Additional webcasts will be offered throughout 2012 to provide an in-depth discussion on the features in these releases. We encourage you to attend this kick-off Tech Talk. In this session, we will review foundational cryptographic concepts and discuss the key highlights of the new DB2 native encryption capability, including encrypting online data, encryption backup images and key management. Matt Huras from IBM development gives an intense technical overview of IBM's latest DB2 for LUW release know as DB2 10.5.4 and Cancun. In-memory, columnar, faster analytics, high availability and scalability. There is a lot happening in the data management space these days. In this presentation, we will go through some of the key capabilities in the newest release of DB2, including BLU Shadow Tables, standard TCP/IP sockets for pureScale, and other enhancements. We'll also talk through some of the latest competitive announcements and how DB2 stacks up to these offerings. Analytics are the hot business need because the competitive advantage goes to the organization who is first to discover and capitalize on the business insight. Data is at the root of this, but it is the analytics that provide data value. For many years DB2 has been used with OLAP and OLTP systems by SAP customers worldwide to deliver a cost-effective database engine to SAP applications. Now with DB2 10.5 with BLU Acceleration, you can use this next generation in-memory technology to deliver these insights from data fast and simply. DB2 with BLU Acceleration is an in-memory technology, which makes analytical jobs by factors faster right out of the box, while requiring dramatically less storage and nearly eliminating the need for tuning. Although BLU Acceleration is in-memory optimized, it is not main memory-limited. DB2 BLU is highly optimized for accessing data in RAM, but performance won’t suffer as data size grows beyond RAM. These benefits are achieved through next generation columnar processing, operating on compressed data, carefully exploiting modern microprocessor designs, and accessing memory efficiently. The result is a system that simultaneously looks and feels like DB2 while being in-memory optimized, CPU-optimized and I/O-optimized. SAP-DB2 customers have seen tremendous performance improvements with the same hardware. Because of this, customers can reuse their existing IT infrastructure and simply update to the newer DB2 10.5 version-- converting row-store tables to column-store tables. Join DB2 - SAP expert Guersad Kuecuek for a discussion of the technical features of this solution including how to use BLU, how to derive performance improvement and how to do the sizing for BLU. Judy Ruby-Brown gives a thorough overview of system level backup and using FlashCopy for disaster recovery as provided by various vendors. This presentation is quite thorough but yet very easy to understand, even for a beginner. Judy explains the types of services that need to be setup for disaster recovery as well as easy scenarios for the DBA in the implementation of disaster recovery. Just the summary at the end is enough to pass on to the system programmers in your shop as a checklist for implementation. The "Internet of Things" is the growing number of devices and sensors that communicate via the Internet, offering vast new opportunities. Harnessing data from billions of connected devices lies in the ability to store, access and query SQL and NoSQL data together, seamlessly. The result of all this data is the need for fast development of web and mobile applications and speed-of-thought insight for fast business decisions. Learn how to use Informix and DB2 to bridge the gap between new computing technologies designed for big data, cloud, and mobile computing with the enterprise world of relational data in the "Internet of Things" era. Jef Treece and Shawn Moe will present how to develop mobile applications using techniques that preserve the native look and feel specific to such devices as Android and iOS. They will also show device-agnostic techniques and discuss new approaches to handling a range of types of mobile devices. A discussion of how to keep data on the device in sync with a back-end database or cloud service, such as DB2 or Informix on BlueMix will also be included. And finally, using an embedded database to achieve a truly scalable and reliable Internet of Things architecture will be included. In this comprehensive overview of DB2 10 for z/OS Lori Ann Galluzzo goes through the features of DB2 10 in great detail. Each feature is discussed, along with how and when to take advantage of the feature, as well as some pitfalls and things to watch out for. Today in order to remain competitive, there is a tremendous demand on lines of business to be able to analyze more aspects of business data and do this very quickly. There is a control shift to the business analyst so they can analyze what they need to, NOW! Big Data requirements are also emerging, even as everyone is being asked to accomplish more with less. Join us to learn how the combination of DB2 10.5 with BLU Acceleration and Cognos BI 10.2 can help bring sanity to satisfying these ever increasing demands. We will provide an overview and technical deep dive of DB2 10.5 with BLU Acceleration, Cognos BI 10.2 and Dynamic Cubes. Join experts from the DB2 and the Cognos BI teams who will also explain how these two offerings fit together and the benefits they have provided to clients already. See the value that DB2 with BLU Acceleration can bring to Cognos BI, and ask these experts your questions, so you can understand how this solution helps solve business challenges. Conference Chairman Bob Vargo gives attendees a detailed overview of the conference, seminars, keynotes, and the technical sessions that will be featured at this year's North American conference. Viewers are introduced to the schedule, speakers, and are given tips and insights into the conference. Watch a demonstration of IBM Cognos Business Intelligence running on a DB2 BLU Acceleration in-memory database. The demo compares, side-by-side, the performance of a dashboard sitting on top of a traditional row-based data warehouse with indexes, versus a dashboard sitting on top of the same database, with BLU Acceleration. BLU Acceleration is an innovation from IBM Research and Development labs that delivers a new generation of In-memory database technology, for "speed of thought" analytics. Coupled with Cognos Dynamic Cubes, it results in sub-second query result times. See it for yourself! Nick Ivanov is presenting this talk based on his consulting experience with many customers to maximize use of IBM DB2 and other products; move applications to DB2; and tune database and query performance. Although the DBA’s tuning efforts often result in both a decrease of CPU consumption and end user response times, the perception of DBA activities at the C-level sometimes is more of the kind “why didn't they do that before?”. This presentation helps you to better understand the C-level perspective and shows you how we managed to improve the image of the DBA team from a reactive team of techies to a proactive team that is directly involved in improving the business results. IBM InfoSphere Information Server is a market-leading data integration and governance platform. It provides a set of capabilities to build confidence in your data by helping you understand, cleanse, transform and deliver trusted information to critical business initiatives, such as big data, master data management and point-of-impact analytics. Information Server provides comprehensive connectivity to DB2 (including DPF and BLU Acceleration) and it can also push computation to DB2 when appropriate. By using Information Server with DB2, you get its best-of-breed capabilities to integrate DB2 data and manage its metadata as well. Join us for this DB2 Tech Talk to learn how using these products together can help you deliver trusted information to your business, support big data initiatives, and more. In March 2013 the IDUG DB2 11 Editorial Committee was formed, comprised of volunteers from IDUG’s worldwide community of DB2 users and consultants. Working alongside IBM's formal Early Support Program (ESP), the Editorial Committee gained valuable insight into exactly what makes the new release tick. The White Paper, available on the IDUG web site, contains their findings, including practical experiences and independent evaluations of the new features. DB2 11 contains a large number of enhancements, but some will be of more interest than others depending on your job role and background. The paper has been organized according to the features likely to be most applicable to each of the three major technical roles in a DB2 for z/OS environment: Systems Programmers, Database Administrators and Application Developers. This presentation from the IDUG EMEA 2013 Technical Conference looks at some of the key findings presented in the paper. IBM InfoSphere Optim Workload Replay can significantly improve your database testing experience and help you successfully manage change in your database environments, whether you are adopting BLU Acceleration, upgrading DB2, or making the move to DB2. Using InfoSphere Workload Replay, you can build realistic testing environments to help assess a wide range of database changes before production deployment and without extensive script creation or application setup. This makes the change process faster and less risky. In this session, we will examine the use of InfoSphere Workload Replay to facilitate database testing in efforts to validate version, platform or infrastructure changes. We will discuss how to use the tool to prepare for BLU Acceleration, and review some of the key use cases. Learn the testing methodology and the various features to control capture, replay and generate reports. Using this realistic testing approach you will find key issues sooner in the test cycle, and resolve them before the deployment day. Stored Procedures and user-defined functions are a great way to consolidate database logic, improve database performance, code re-use, security and integrity. Stored Procedure development in DB2 has always been an integral part of the database, and in this DB2 Tech Talk, we will look at how IBM Data Studio helps accelerate the development and debugging process. IBM Data Studio is a comprehensive database development and administration environment. It includes the tools needed to develop and deploy Stored Procedures. We will look at the various wizards and options available to create a SQL Stored Procedure and walk through the debugging of that stored procedure in a DB2 environment. This one-stop webcast channel makes it fast and easy to build and extend your technical skills on the IBM DB2 product family. IDUG has joined forces with IBM to bring together a wide array of learning sessions on technical product features, related products, new product developments and more.